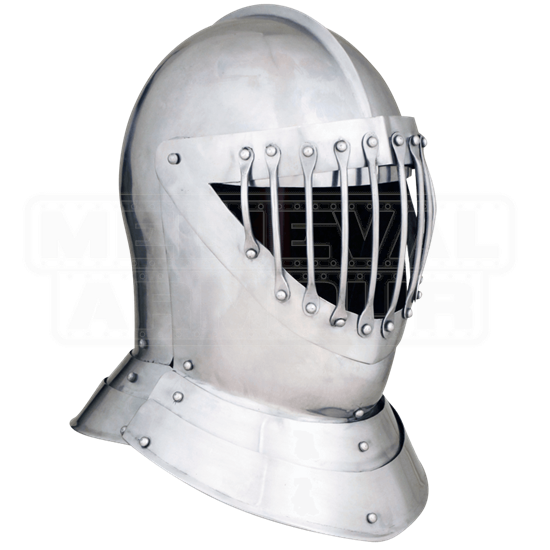 This English Knights Combat Close Helm is based on the style of helmet that became popular during the end of the medieval era, as well as during the early renaissance era, thanks to the comprehensive amount of protection that the helmet provided. Compared to the sallets and barbutes of the eras prior, this helmet was a marked change, ensuring that the head and neck were fully covered. As its name suggests, this helmet is based on a combat design, one that featured solid protection as well as an open visor, for a clear, commanding view of the field. The helmet consists of a tubular head protector, connected to hinged gorget, which rests around the collar, providing the highest degree of protection to the head and neck possible. The top of the helmet also features a small central ridge, which helps to shunt blows off to the side, ensuring that they do not land solidly atop the head and instead are diverted down the sides of the helm, reducing their impact. All close helmets possess a visor of sorts, and on this combat model, the visor is left almost completely open, ensuring that the warrior within can see out, while vertical steel bars provide a solid amount of protection against any errant attacks or blows that might reach the face. The helmet is offered in one size, and it can be ordered in either 16 gauge or 14 gauge steel (16 gauge is more suitable for light reenactment, LARPing, and some SCA, while 14 gauge steel is hardier and made more for combat). Pair this English Knights Combat Close Helmet with some additional armour, and you will look every inch the knight in shining armour, ready to take to the field and win the event, and perhaps, a fair ladies token, as well.